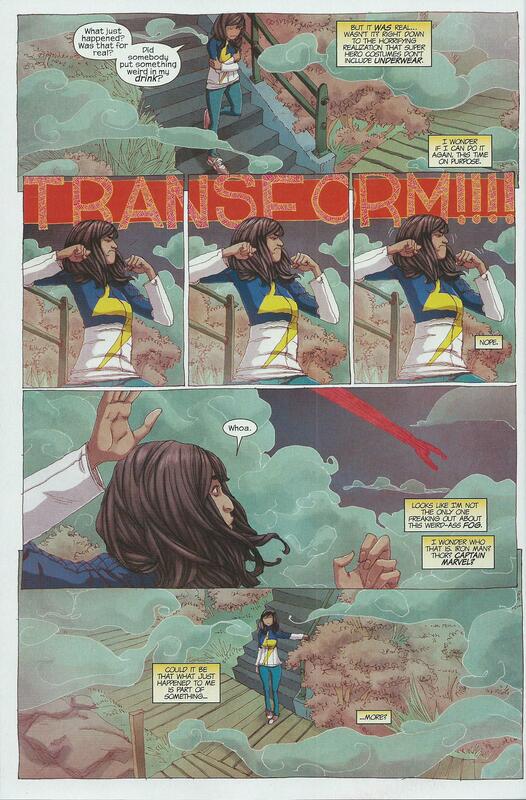 We were introduced to Kamala Khan, a beautiful 16 year-old teenage girl, in the debut issue of Ms. Marvel. Kamala is a Muslim who loves comic books. She is also mouthy, assertive, and appears to stop at nothing to get what she wants. She even snuck out of the house to attend a party. In other words, Kamala Khan is a typical teenager in mainstream America. But we don’t know how much longer all that will last, as Kamala was mysteriously transformed into Ms. Marvel. So far she knows that she is able to shape-shift, grow, and shrink in size. In the current issue of Ms. Marvel, Kamala tries to figure out what has happened to her, while at the same time trying to learn what her superpowers are, and how to use them. But the most important question is, is it meant to be? Was she purposely chosen to be the new Ms. Marvel? G. Willow Wilson is the writer of this title, published by Marvel Comics. Realistic dialogue, and phenomenal character interactions. 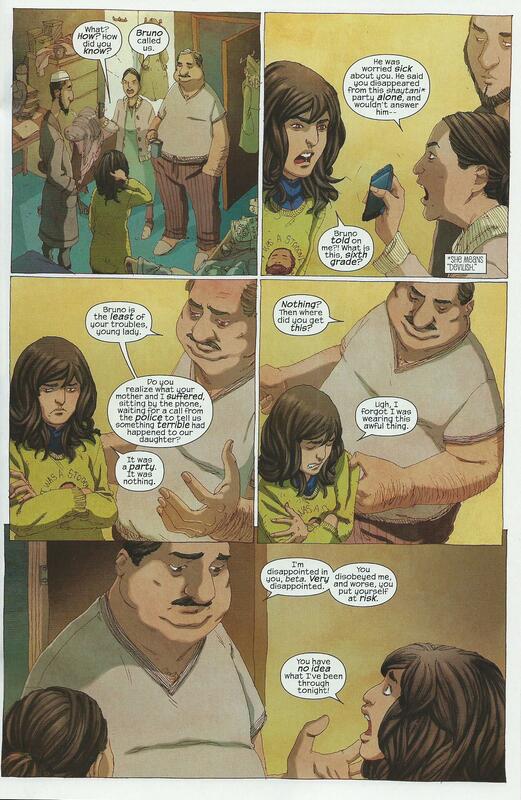 I especially like the distinctive voices of the characters, Kamala’s family most notably. 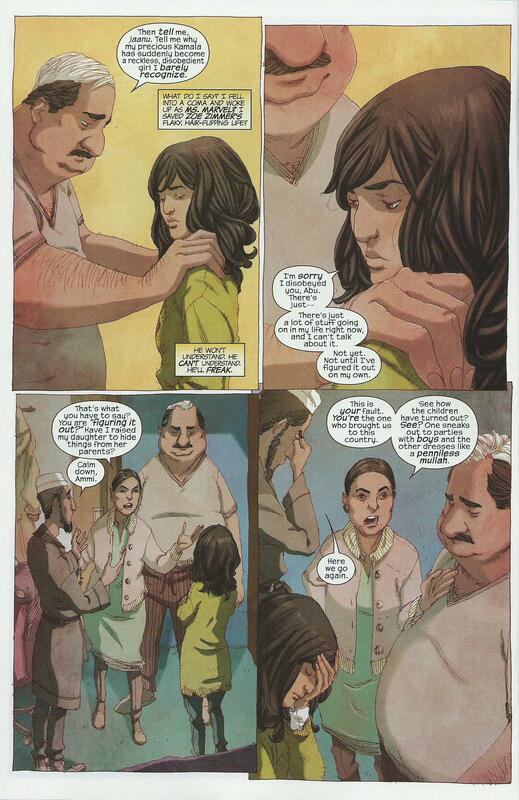 Here are a couple of pages from the current issue, showcasing sharp dialogue among Kamala’s family. The creative art time includes Adrian Alphona (artist) and Ian Herring (colors). 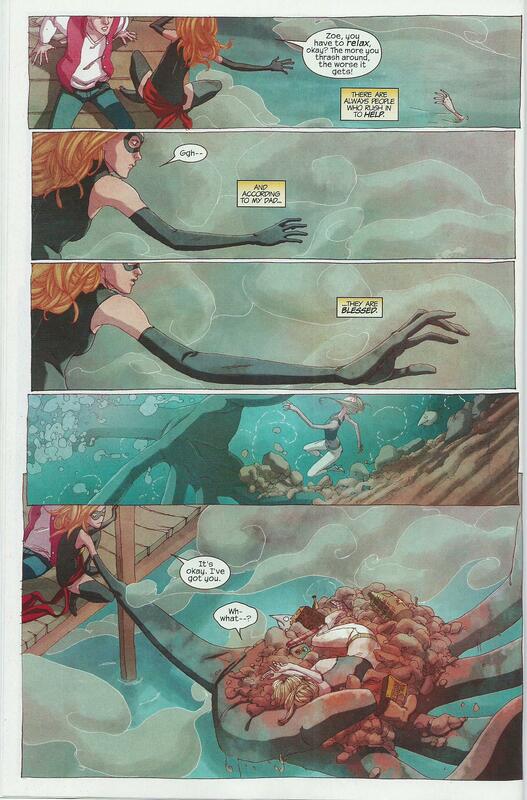 Superb art, especially the transformation into Ms. Marvel. 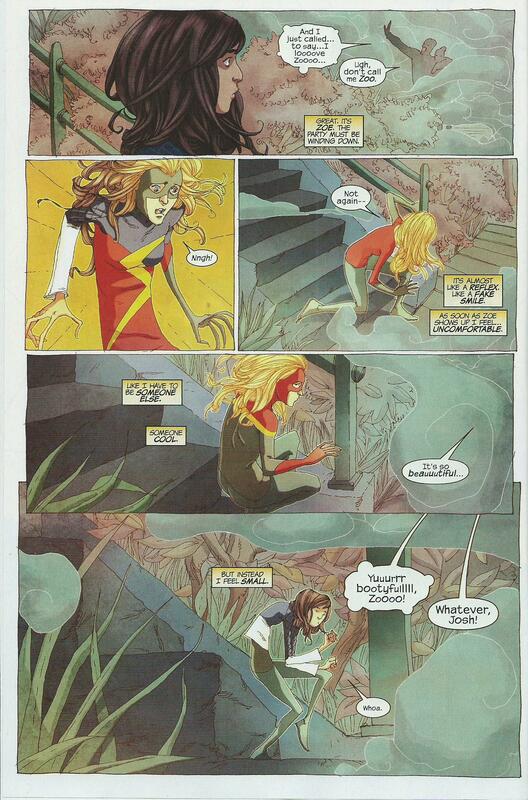 I especially like the distinctive coloring on both Kamala and Ms. Marvel. Brown skin vs. white, dark hair vs. blonde. I also liked the panels where Kamala didn’t realize she shape-shifted back to herself, as she snuck back into her home and faced her brother. Alphona and Herring makes a great visual storytelling team. 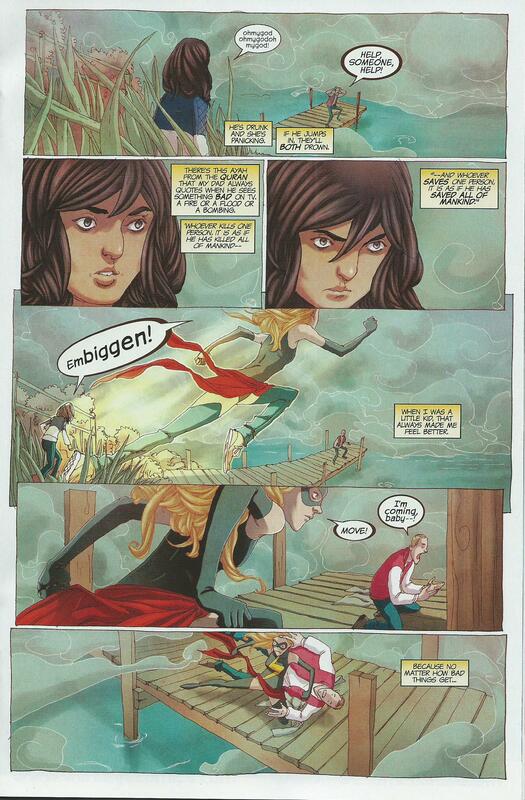 To let their work speak for itself, here are a few pages from the current issue of Ms. Marvel. 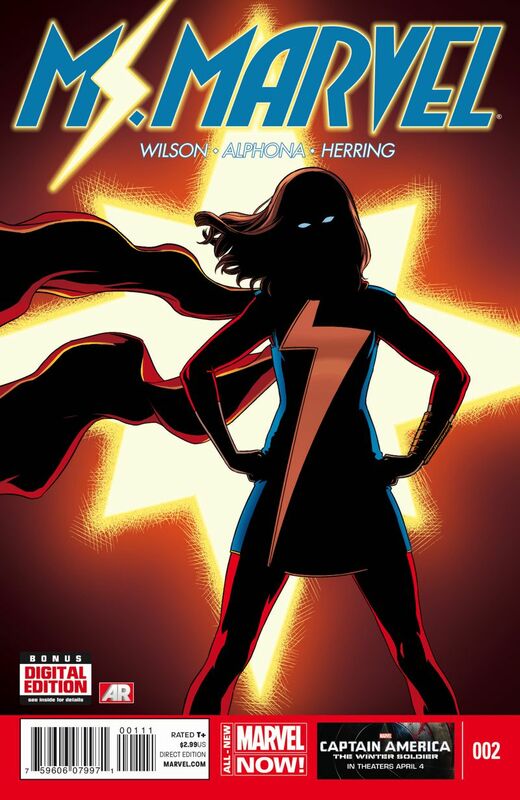 Ms. Marvel is more than a superhero comic book. It also focuses on family values. Kamala is torn between abiding by the principles upon which she was raised, and that of mainstream society. The comic is centered around a Muslim family, but there are themes in the book that applies to every family, no matter what culture or religion you belong to. Last Friday at the shopping mall, I met a lady that was standing outside the library handing out literature. She greeted me with a smile and asked if I was interested in some reading. She pointed inside the library, and I saw a small group of women sitting at a table with pamphlets and books. The lady said they were trying to get out and meet people, and talk to them, because a lot of people don’t know who they are, and what they are about. They were Muslims. I said, “You may find it funny, because a lot of people do when they find out, but I read comic books.” She laughed, leaned forward and said, “I have a secret too!” She told me what she reads and we burst with loud laughter. As soon as I mentioned Ms. Marvel, she said they all knew about the book, but didn’t know that it was already out. I told her that I had been curious since I started reading Ms. Marvel, and wanted to learn more about Muslims in hopes of me getting a better understanding of the story. I then started telling her about the comic. She was very excited and asked where she could find a comic book shop. I told her the locations of the two that are in the area, but I could tell she wasn’t familiar with the streets. She asked if she could buy it online and read it, because she really wanted to read the book. I also mentioned a physician that I work with, who’s from Pakistan. I told her we occasionally discuss world issues. He will mention what the Quran says, then ask me what the Bible says. She asked his name and immediately knew who I was speaking about! She invited me invited me inside the library to meet the other ladies. She told them that I read the comic, and mentioned my co-worker. They were all very friendly and said the Muslim community knew about the comic, and they wanted to read it. I told them I wouldn’t be able to make it to their informational meeting later on, so they let me grab whatever handouts I wanted from the table, including a copy of the English translated Quran. When I picked my son up from school a few minutes later, we went to the nearest comic shop to look for Ms. Marvel. We found a copy of the first issue, second print. I purchased the book, and took it to the group at the mall. The lady I met and spoke with first wasn’t there. It was a different group. But they were already aware of me, and said they would make sure that she read the book first. By the way, the comic was placed into a Free Comic Book Day bag. Hopefully that bag will attract new comic book readers! I have another physician co-worker that is from Yemen. He purchased a home last summer in a high-demand area. He was outside building a retaining wall, when he sensed that he was being watched. Sure enough, he turned and saw his next-door-neighbors staring at him from their fence. He immediately walked over to the fence, smiled, stuck out his hand for a handshake, and introduced himself. He killed the heck out of them with kindness. That quickly ended all the staring and whispering. When you ask people what they wish for, a lot of them always say world peace. It’s not difficult to achieve world peace. We have to be at peace with ourselves first, then be at peace with our neighbors. I am definitely going to continue reading this awesome new title. If you are looking for new comics to read, I strongly suggest Ms. Marvel. There is no doubt that this issue gets 5/5 stars.